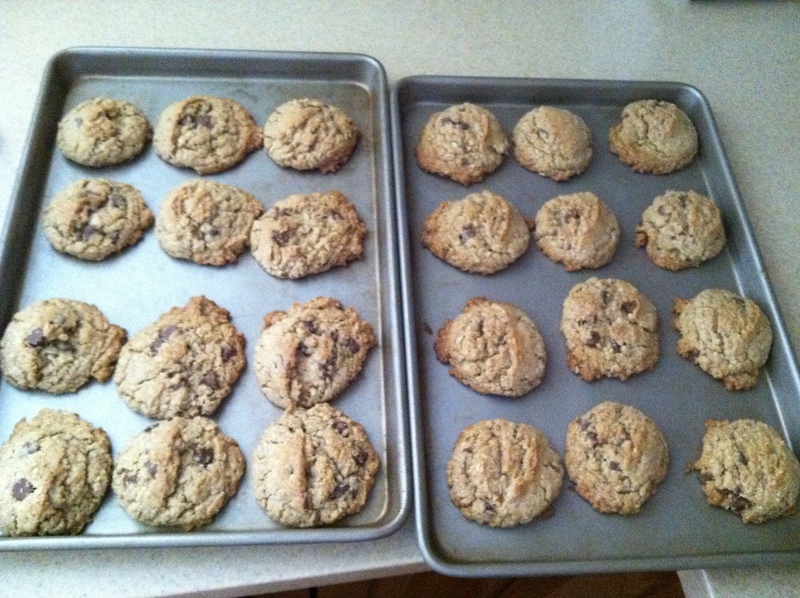 Today I made two batches of cookies and black bean salsa before 11 am. Normal? Probably not. I’m going to Long Island this weekend to visit all of my roommates, and incidentally my sister is coming home from Baltimore with two friends. Scheduling conflicts. My mom is acting like the entire cast of Modern Family is coming to town, menu planning and buying excessive amounts of food, some of it in bulk. Jalapenos, for example. A gallon jar, in order to throw six or seven on top of a taco dip. This is where I get my logic. Anyway, this is why I was so busy in the kitchen. I always volunteer to make the black bean salsa (recipe coming soon) because it gives me a chance to practice mah knife skillz. And the cookies were just for fun. The first batch were Jessica’s giant rainbow cookies. This was my second time making them, and they turned out excellent. I packaged those up to send out to the lake for my sister and her friends. I didn’t bother to photograph because Jessica is far superior. Just click the link. The second batch are for me to smuggle through airport security to Long Island muahaha.. just kidding I think that’s legal. These are the cookies I’ve been baking since I was about ten years old- we go way back. The recipe is actually the one from Neiman Marcus (if you’ve already heard this legend you can skip ahead.) Essentially the story goes that a woman went in for a little shopping and lunch, and happened to have one of the fabulous cookies for dessert. She asked the waitress what it would cost to get the recipe, and the waitress casually replied “two fifty.” The woman assumed she meant two dollars and fifty cents, and asked the waitress to add it to her tab. When she received her credit card bill later that month and saw that it was in fact a two HUNDRED fifty dollar recipe, she called Neiman Marcus and they refused to give her money back, so she leaked it all over the internet. If you are a fan of thin, crispy, back-of-the-Tollhouse-bag cookies, this recipe is not for you. These cookies are a meal. They are fat and chewy and hearty and delicious. I started by assembling all my dry ingredients: flour (I use whole wheat), baking powder, baking soda, salt, blended oatmeal, and blended walnuts. You can omit the nuts, but from my experience they make the cookies much moister. 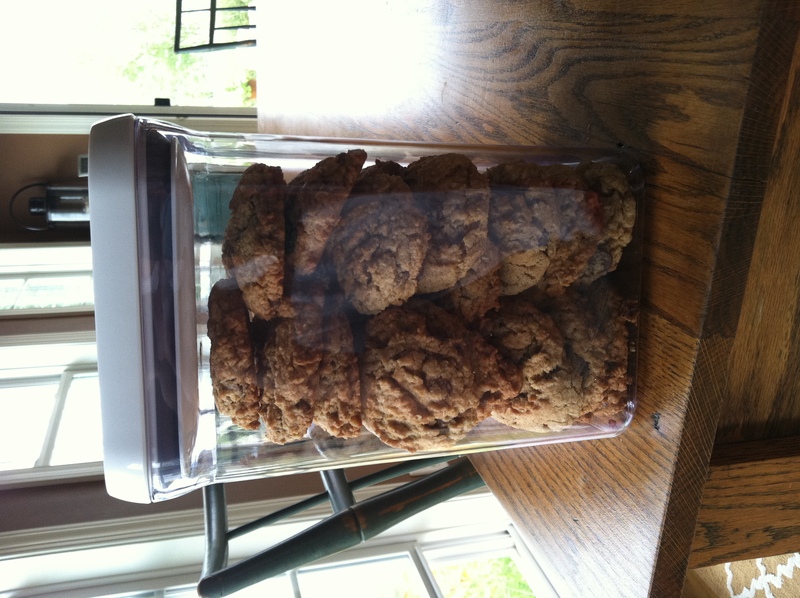 People who have textural problems with oatmeal raisin cookies or with nuts in desserts will be fine here- everything is ground up to a powder, thanks to my Emeril blender. This was a Christmas gift to the family this year. I remember seeing it opened and asking my mom with unnecessary annoyance why we needed a new blender. She said “Because you broke the other one.” I got irrationally mad and started yelling that that was untrue until I remembered that I had, in fact, smashed it to a million pieces by dropping it in the sink a few days prior. It’s just as well, it was as old and ghetto as our food processor. Today when I reached for the oatmeal in the pantry I dropped it and it spilled into every nook and cranny of the shelves and floor. I will forget about that, too. I’m perfect. 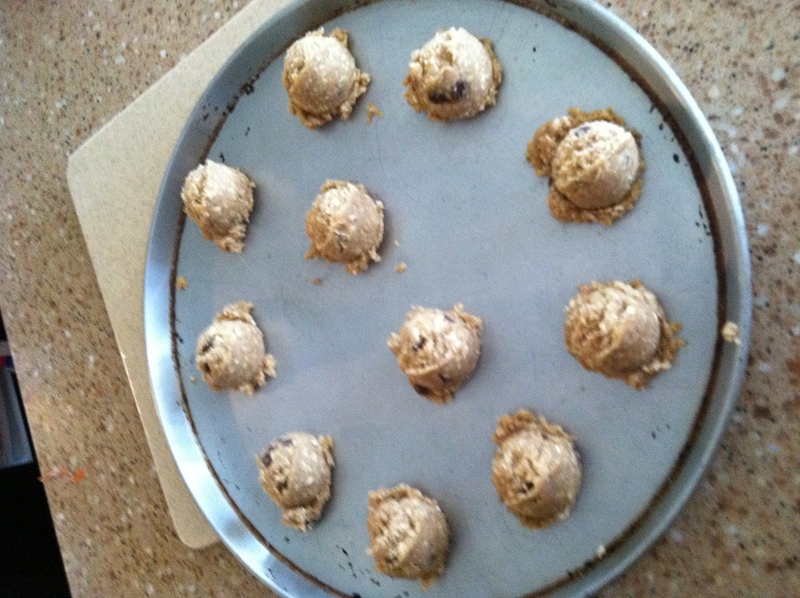 The other important thing to making these cookies super moist is making sure the butter is SOFTENED, not melted. The dough does get difficult to stir with the lack of liquid- I often have to switch to my hands, but it is so worth it. Giada told me in one of our private talks that when you melt the butter all the way, cookies will spread in the oven and get thinner and therefore crispier. When the butter is intact, it first melts within the dough and THEN starts to spread, so the cookies stay rounder and thicker. That makes sense in my head, I have no idea how it’s translating to text. I’ve also stored this dough in the refrigerator for a bit before baking them off which helps even more. If you’re thinking way ahead (which has never happened to me) you can let the butter sit out and adjust to room temperature. Or you can microwave it for about 30 seconds. Then I use my handy dandy pre-measured cookie scoop. And bake. I sit in front of the oven and inhale the smell like a dog. Today I went to Marshalls/Home Goods, which is a 3-4 day a week habit for me, and found this lovely canister with the pop-up top. I wanted to buy the whole set, but I treated myself to one. Yes, tupperware is a pleasure purchase. I also didn’t realize until I got home that my shirt and shorts were stained literally everywhere from my cooking and baking endeavors. Hope the paparazzi didn’t catch a glimpse. If you’re wondering if I stashed dough in the fridge from both the rainbow cookies and the chocolate chip, you would be correct. Next week is going to be wild.